> Now integrated in machines! Large raw parts (> 1m3) require time consuming Set-Up processes, even more than the machining process itself. VSET is a new measuring system, based on 3D vision technology, which reduces the best fit calculation and alignment time of large raw parts. The system is based on photogrammetric technology to measure the part thanks to different reference points located on the workpiece. The information generated during the measuring stage is automatically compared to the 3D model of the part to calculate the best fit. Once the raw part is validated it can be aligned in the machine using the same reference points. 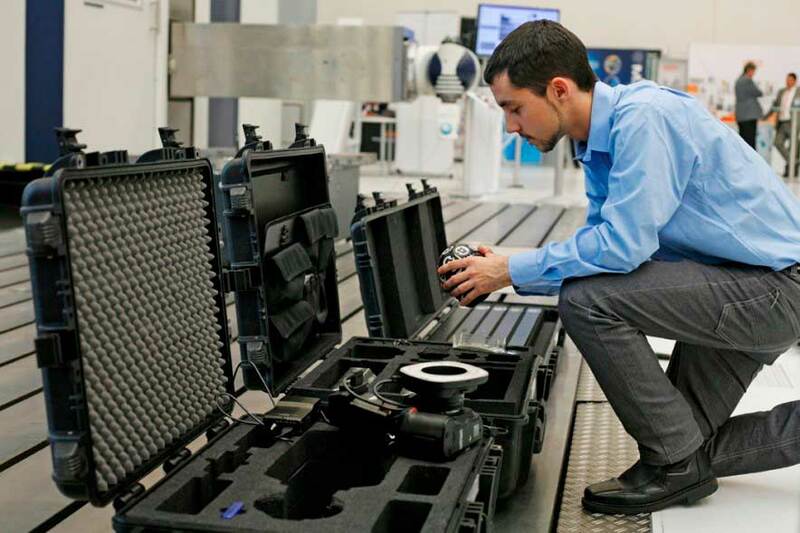 The measuring module is primarily made up of a set of optical markers and calibrated bars, a self-calibrating digital photogrammetric camera and a laptop computer, all of which are presented in security trolleys and cases that are easy to use in these industrial environments. The laptop has measurement software that is able to configure the point cloud of the geometry of the part based on photos that are obtained around the part. The fitting module is a software development that is related to the measuring module, which, based on optimisation algorithms, almost immediately carries out 3D fitting calculations of the finished part, comparing them to the point cloud defined by the blank. The result of this measurement and fitting is a reference report that will make it possible to align the machine in a simple way, using probing procedures that are usually already incorporated into the machine. This software module allows the automatic integration of fitting results into the machine control and, through calculation algorithms, makes it possible to carry out an automated, guided alignment process, facilitating and further reducing the time of this work.